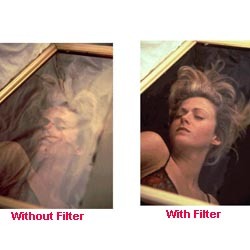 Clear Filter (UV) - A UV Filter protects your camera's lens from scratches, dust, dirt, moisture and fingerprints, while reducing unwanted ultra-violet light. Leave it on your lens at all times. Absorbs UV rays, giving sharper contrast to your film or video. 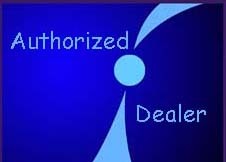 Circular Polarizer Filter (C-PL) - Polarizer's let you achieve vibrant color saturation, reduce or eliminate glare and reflections from non-metallic objects and glass surfaces, and minimize haze. 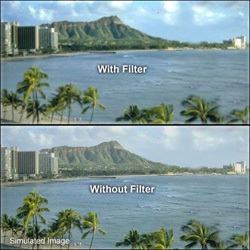 The filter can be rotated to determine the amount of reflection to be removed. 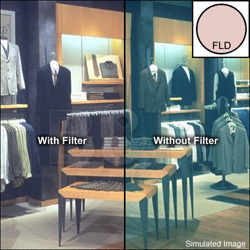 Fluorescent (F-DL) - The F-DL fluorescent light correction filter true-to-life color rendition by removing the harsh yellow-green cast ordinarily resulting from fluorescent bulbs. When shooting under natural light, a fluorescent filter dramatically increases color saturation of subjects.